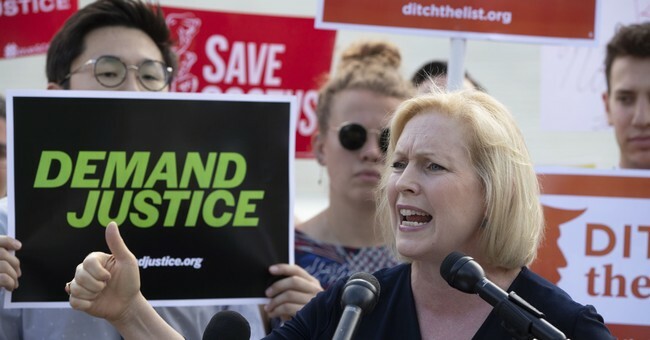 Sen. Kirsten Gillibrand (D-NY) said Sunday that the “first thing” Democrats should do if they flip the House and Senate is to “get rid of” Immigration and Customs Enforcement (ICE). “So when we flip the House and flip the Senate, I think the first thing we should do is deal with the children who have been separated from their families at the border. I think we should get rid of ICE,” Sen. Gillibrand said at New York City's OZY Fest 2018. Sens. Gillibrand, Kamala Harris (D-NY), and Liz Warren (D-MA) have all recently called for abolishing ICE. The subject emerged following Democratic socialist Alexandria Ocasio-Cortez's stunning primary victory over Democratic Caucus Chair Joe Crowley (D-NY). Ocasio-Cortez is calling to abolish ICE as part of her campaign platform. Gillibrand said that another thing Democrats should address immediately if they flipped the Senate and House was gun reform. She went on to say that Obamacare had been too much of a compromise with Republicans and Democrats should’ve attempted to pass Medicare for all.